Sydney is the largest and oldest city in Australia and also the culture and business center of the country. Together with the suburban the population of the city is about 4.3 million citizens. Sydney and its suburbs are considered the largest financial, transport, commercial and cultural center in Australia, rivaled only slightly smaller Melbourne. Its rapid growth during the second half of the twentieth century has left not only on his impressive modernist architecture and presented by high rising skyscrapers and glass mirror surface, but also in its cosmopolitan population, which is as diverse as that of cities like New York and London. Today in the 21st century Sydney is more attractive, because of its great capacity for work, business and education. The city universities are among the best and highest quality in the whole world and the provide education that is recognized and appreciated worldwide. Sydney is a city with international importance in the sphere of the science and high technology. Because of the reputation enjoyed by Sydney attracted numerous investors and millions of tourists from all over the world. There are many wealthy foreigners who want to buy property in this beautiful city, because it is quite calm and has important culture significance. Definitely the gleaming white sails of the Sydney opera on the edge of the bay are the trademark of the city and bring the style of the beautiful destination. 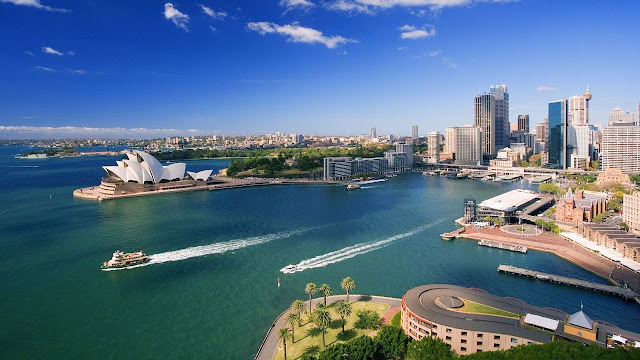 The city is great tourists destinations, who want to see the culture of Australia, or have a calm holiday in one of the most picturesque nature of the world. The geography of the city is very advantageous because a wide outlet to the Pacific Ocean and is located not far from the rapidly developing economies of East and Southeast Asia. The beauties of the city are numerous. Sydney is one of the most impressive cities in the world. It is world famous for its incredibly beautiful beaches. In general, all parts of Australia have a beautiful coastline and impressive, but Sydney is outstanding. Bondi, Manly, Palm Beach – these beaches are a favorite of tourists and surfers. All beaches are white, fine sand with golden hues. The territory of Sydney are a large number of open spaces, the city has access to ponds and even in the city center has many parks and gardens. In the central business district are the Chinese Garden of Friendship, Hyde Park, the Domain and Royal Botanic Gardens. Within the urban agglomeration are several national parks, including the Royal National Park, the second oldest national park in the world. Several parks in the extreme western parts of Sydney are part of listed as World Heritage Area Greater Blue Mountains. But definitely the highest attraction for the guests of the city is the opera of Sydney, which is a symbol of the city. Travel in Australia is a great journey and will meet you with calm weather and very beautiful sightseeings all around the nature wonders of the world.